The Beginning of the End for Pitch-Framing? Pitch-framing as an idea has existed for almost as long as the game, but it wasn’t until we started getting numbers for it that people really started to think about it in depth. At that point we were introduced to the idea of a catcher potentially being worth a few extra wins just because of how he catches pitches behind the plate. That was startling, and it was fascinating, but there was an important question that wasn’t being discussed enough — is the existence of pitch-framing good? Valid arguments on either side. But it seemed that there was nothing to be done until we got an automated strike zone. Humans will be humans, after all. On the other hand, humans can change. Humans can learn; humans can be trained. One interesting observation during the PITCHf/x era is that, over time, those human umpires have collectively started to call an increasingly consistent zone. PITCHf/x provided feedback, and umpires could get better as a result. Now, I can’t help but wonder if we’re seeing the beginning of the end for pitch-framing. Catchers are always going to catch a little differently, but I wonder if there are fewer available rewards. The slope of the line is lower. The correlation is a great deal lower. 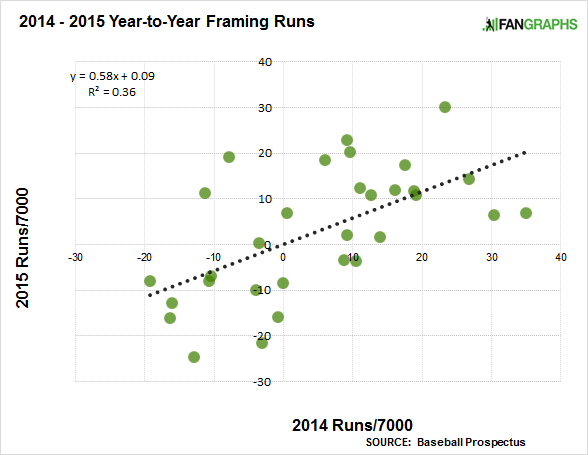 Relative to the rest of the era, performance in 2014 wasn’t all that predictive of performance in 2015. These are actually the lowest numbers yet. To qualify, a catcher must have 2,500 framing opportunities in consecutive seasons. Original information from baseball Prospectus. The most recent slope is the lowest, by a pretty good amount. And the correlations used to be pretty consistent, until a step back two years ago and a bigger step back one year ago. It’s not shown here, but the top 10 framing catchers from 2014 kept just 57% of their value in 2015, which is another low for the PITCHf/x era. Because we have just this limited information, we shouldn’t make too much of it yet, because there’s some chance it’s a blip. A dip, instead of a decline. But I think there’s an excellent chance we’re seeing an umpire response to something that’s generated an awful lot of attention. I’ve had to think about this for a few days, but I’ve almost fully come around. We’ve definitely seen teams respond to pitch-framing data. 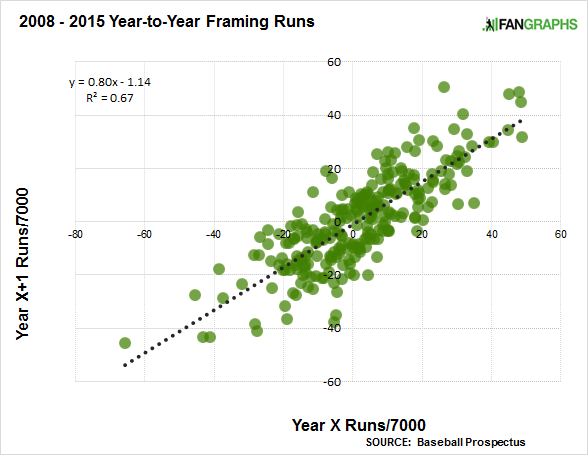 Some of them have talked about it publicly, and last year there was the lowest-yet standard deviation for pitch-framing value. Teams have understood the importance, so there have been fewer awful receivers, raising the floor. It’s been a point of instruction. Why should teams be the only people paying attention? Framing has to do with strikes and balls. You’d better believe this is relevant to umpires, and to the people in charge of them. Pitch-framing isn’t just some nerd interest. They talk about it on television broadcasts. They talk about it on the MLB Network, and they write about it on the MLB website. It’s still not household information, like saves or RBI, but it’s known in the industry, and along with that comes knowledge of who’s supposedly good at it. Lucroy has gotten a lot of coverage for his masterful receiving. So has Brian McCann, who’s statistically declined. Just after people talked a good amount about Hank Conger, his numbers fell off. Same with Rene Rivera. Same with Yan Gomes. Some catchers have remained really good, but enough have declined that you have to wonder. The theory would go like this: more than ever before, umpires are aware of good framers. They’re aware that good framers can get strikes out of the zone, so then that introduces a bias. Umpires don’t want to be wrong, and their bosses don’t want for them to be wrong. It’s not like an umpire would watch a pitch, then think about a call, then think about the catcher, then change his mind. These decisions happen way too fast, but you’d just have to believe there’s some effect. A different call out of every 10, or 20, or 30, or 50. Something that would show up in bigger samples. It makes sense that, if umpires became aware of great pitch-framing, they might become aware of ways to call the game that have a little less to do with how a catcher moves. And you have to think framing has been on their radar. It’s a really extraordinary situation. Pitch-framing research uncovered an area where teams could gain or lose rather significant value. Some teams acted on that, and some teams have benefited, but the unusual thing about this is it’s related only somewhat to actual on-field talent. The rest is in the hands of the umpires, and at some point, umpires were going to catch wind of what was taking place. And then they could have a response, because umpires don’t want to be manipulated, not intentionally and not for a team’s direct gain. There is an alternate explanation, or — if you prefer — a partial explanation. As noted earlier, we’ve seen league buy-in as far as framing goes, and last year individual framing value among the catchers had the lowest standard deviation yet. Which means there’s less of a spread between the best and the worst, and maybe what we’re seeing is just randomness somewhat taking over. The lesser the spread of talent, the greater the role of randomness in determining the results. That could get at the lower correlations, and it would kind of point toward the end of framing in a different way. If everyone’s good, then no one is good. It’s too soon to say for sure what all is going on. And framing will presumably always matter some, until or unless the strike zone is automated. But, within the industry, there’s been a line of thought that pitch-framing value would be only temporarily useful. Could be we’re starting to see what they mean. We hoped you liked reading The Beginning of the End for Pitch-Framing? by Jeff Sullivan! Especially after watching the NFL refs basically script every playoff game from start to finish, and then having to listen the broadcast crews make excuses for them.